+ What is the Stop Explosive Investments campaign about? The Convention on Cluster Munitions (CCM) bans the use, production, stockpiling and transfer of cluster bombs. However, cluster munitions continue to be produced in some countries that have not yet outlawed these weapons. Although countries that have joined the CCM must stop producing cluster munitions, some banks and other financial institutions in or from these countries continue to fund their production by investing in corporations that manufacture them elsewhere. This undermines the commitment these countries have made to ban these weapons and runs counter to their obligations under international law. To help monitor and curtail the flow of funds to corporations that still manufacture cluster bombs, the Cluster Munition Coalition set up the ‘Stop Explosive Investments’ campaign in October 2009. + Why should financial institutions not invest in companies that produce cluster munitions? Cluster bombs have killed and injured thousands of civilians for decades and continue to do so today. They cause widespread harm on impact and continue to remain dangerous for decades, killing and injuring civilians long after a conflict has ended. To invest in cluster munition producers is to invest in the misery they cause. Financing and investing are active choices, based on a clear assessment of a company and its plans. Investing in a cluster munitions producer therefore is a choice to support the production of these weapons that cause unacceptable harm. + How can I find out which fianancial instititutions are investing in cluster munition producers? A logical first step is to ask them directly. Unfortunately many financial institutions are not transparent about their investments. Some financial institutions will give clients the impression they invest in a responsible way by showing general business principles like the UN Principles of Responsible Investment (UNPRI) or a Code of Conduct. Since there is often a difference between business principles and business practice, general answers cannot guarantee certainty about their business practice. 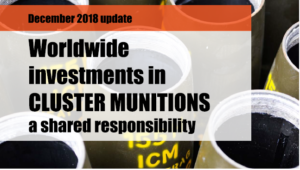 The most recent update of the report ‘Worldwide Investments in Cluster Munitions: a shared responsibility’ lists financial institutions that invest in cluster munition producers in the so-called Hall of Shame section of the report. + What if my bank, insurer or pension fund is not in our report? That’s good news! Your financial institution is not investing in producers of cluster munitions. To make it better: let’s see if your bank, insurer or pension can serve as an example to others and be included in the Hall of Fame or Runners-Up: does it have policies in place to warrant this? Contact the institution to find out and do inform us if we can add it to the Hall of Fame or Runners-Up. + What are we asking financial institutions to do? Financial institutions should develop policies that exclude all financial links with companies involved in production of (key components of) cluster munitions. Because all investment facilitates this production, no exceptions should be made for any type of investment. This includes third party financial services, funds that follow an index or civilian project financing for a company also involved in cluster munitions. Furthermore, financial institutions should inform producers of their decision to end investment because of the company’s involvement with cluster munitions. Financial institutions can set clear deadlines with a limited time frame within which a company must cease production of cluster munitions if it wishes the disinvestment decision to be reversed. When a company persists in producing cluster munitions after the deadline, the financial institution will disinvest. New applications for investment will be declined until the company has halted all activities related to the production of cluster munitions. + Which financial institutions have already put cluster munitions policies in place? Fortunately, more and more financial institutions have acknowledged that cluster munition producers are not ethical or viable long-term business partners, and have installed a public policy to end investments in these companies. The report ‘Worldwide Investments in Cluster Munitions; a shared responsibility’ highlights some of these positive examples. The so-called Hall of Fame lists those financial institutions with a far-reaching policy ending all investments in cluster munition producers. 48 financial institutions are listed in the Hall of Fame of the 2018 report update. In addition, the 62 financial institutions listed in the Runners-Up category took steps to ban investments in cluster munition producers, but their cluster munitions policy has certain flaws. + Why should countries take action against investments in cluster munitions? Investment should be considered banned under the prohibition on assistance in Article 1(1)(c) of the CCM. A growing group of states have made interpretive statements indicating that investments in cluster munitions are or can be seen as banned under the convention. Investing in a cluster munition producer clearly runs counter to the spirit of the CCM and runs counter to states’ obligations under international law. + What are we asking governments to do? States that have joined the CCM should make it clear that in prohibiting assistance, Article 1(1)(c) of the convention prohibits investment in cluster munition producers. All States Parties’ national legislation to implement the convention should include a prohibition on investments in cluster munition producers. Alternatively, for instance when the CCM has already been implemented, a separate law on this issue should be established. This provides clear guidelines for financial institutions and is in the spirit of the CCM. + How do I find out what my government’s position on disinvestment is? To gather more information, take a look our ‘States Best Practices page. This shows which countries have passed disinvestment legislation and which countries have made statements that indicate they consider investments in cluster munitions to be banned by the CCM. At the time of writing, 11 states in total have adopted legislation that prohibits (various forms of) investments in cluster munitions: Belgium, Ireland, Italy, Liechtenstein, Luxembourg, the Netherlands, New Zealand, Saint Kitts & Nevis, Samoa, Spain, and Switzerland. To date, 35 states have expressed the view that investments in cluster munitions are or can be seen as prohibited by the CCM. + What does the Convention on Cluster Munitions say about disinvestment? The CCM entered into force on 1 August 2010. It bans the use, production, stockpiling and transfer of cluster munitions. Although the CCM does not explicitly prohibit investment in cluster munitions, the prohibition on assistance in Article 1(1) should be interpreted by states as covering investment in cluster munition producers. Investing in a cluster munitions producer means supporting the production of weapons that cause unacceptable harm. It runs counter to the norm against the weapon. A growing group of states have made interpretive statements indicating that investments in cluster munitions are banned under the convention. + I want to know more! How? Take a look at the Campaigners Guide on the Stop Explosive Investments website. This will offer more information about how to engage financial institutions and governments on the topic of divestment from cluster munitions. It also includes an overview of creative campaigning ideas. For more information about the campaign or the ‘Worldwide Investments in Cluster Munitions’ report, please contact us at info@stopexplosiveinvestments.org.